Surprising Volume and Clarity From a 5" Speaker! 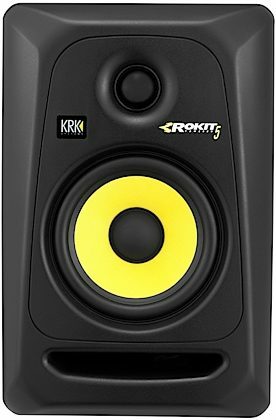 The most compact model in the hugely popular Rokit series of monitors, the KRK RP5 G3 Rokit 5 Generation 3 studio monitor is an excellent 2-way powered speaker from a company with a long-standing reputation for audio design and innovation. The RP5 G3 pushes 50 watts through a 5-inch woofer and a 1-inch soft dome tweeter. The monitor has a frequency response of 45 Hz - 30 kHz and an impressive Max Peak SPL of 106 dB. The Coolest-Looking Speakers on the Market? 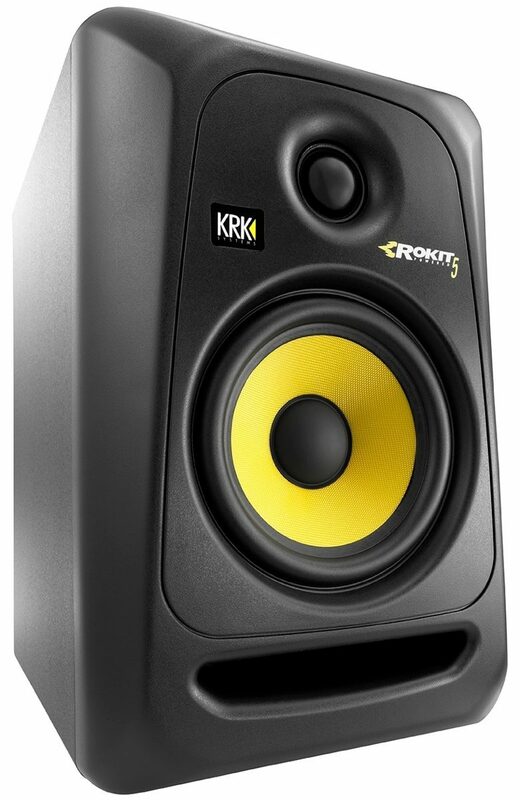 The 5-inch woofer in the RP5 G3 is an Aramid glass composite woofer with KRK's trademark yellow covering. It handles 30 watts of the total output. The 1-inch tweeter is of a soft dome design and channels the other 20 watts. The rear of the RP5 G3 has a 1/4-inch balanced TRS input, and a balanced XLR. There is also an unbalanced RCA input. There are separate High Frequency and Low Frequency level adjustment knobs on the rear of the speaker, which allow you to pad each the drivers with an additional +/- 2dB. This is especially useful for making fine-tune adjustments to your sound based on the characteristics of the room where you have the plugged in. A System Volume knob allows you to pad the master signal up an additional +6 dB or drop -30 dB as needed. The Rokit Generation 3 speakers are made from medium-density fiberboard material covered in black vinyl wrap. They are crafted from a custom composite that ensures a clear and strong forward throw with no cabinet sound coloring the mix. They are also durable and will transport easily if you need to move your listening station from place to place. Overall, the Rokit Generation 3 powered speakers were designed to provide peerless clarity on midrange and vocals while delivering substantially extended bass response. The class A/B amplifier is a totally proprietary design. No less unique is the waveguide design, which ensures detailed sound imaging. The front-firing bass port was designed to reduce boundary coupling so that positioning the monitors in unpredictable rooms would be achievable with far less diffraction distortion. A factory-installed foam pad keeps the speaker and the resting surface isolated from one another, to eliminate cross-resonance that muddies the sound. 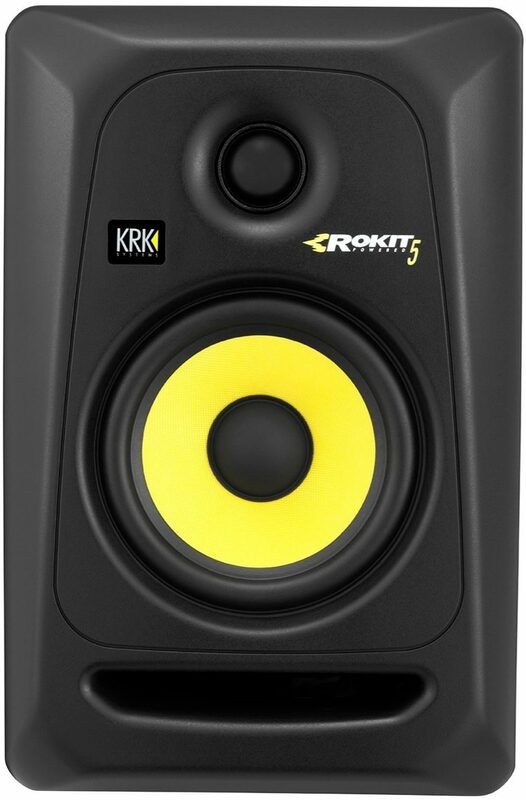 Part of the third generation of KRK's ubiquitous Rokit line of studio monitors, RP5 G3 speakers have been receiving excellent reviews since their release -- and you'll understand why the first time you plug them in! For a quarter of a century KRK has been the professional's choice for mixing and mastering hit records around the globe. And KRK's ROKIT studio monitors have been the most popular choice for accurate monitoring, selling one million systems over the years. 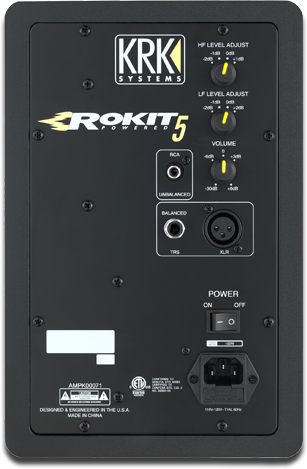 Now KRK introduces the ROKIT 5 Generation 3, continuing the legacy of performance ROKITs have become known for. So whether you're just starting out in desktop recording, or you've already laid down a few thousand tracks, give a listen to the ROKIT Generation 3 line of monitors and experience a standard in performance and accuracy that raises the bar once again. Overall: Nice sturdy build quality. You can tell just by touching that some quality worksmanship went into crafting them. The sound is like the construction, ROCK SOLID. The speakers have a really clean sound to them and the bass is very warm but not muddy. Overall: I purchased a pair of these speakers in the Vintage Gold finish. They look great and sound great as well. I use them for basic editing, remixing, and practicing at home. Perhaps not a great choice for true "flat" response, but with the ability to adjust both drivers individually, more than adequate for a small project studio. close [x]Warehouse ResealedThis is typically a customer return. This inventory includes all parts, components, and manuals (hard copy or downloadable). However, the packaging may be slightly compromised and thus it is not in absolutely perfect, unused condition like our new inventory. KRK does not offer a manufacturer's warranty on Warehouse Resealed products. This inventory is a great value.